I was supposed to write this post last month. If you read my personal reflections post concerning 2017, you can guess that things didn't quite work out well for me last year. One of the little brighter spots from last year was being introduced to Neal's Yard Remedies by my pal Sharon. I have never heard of the brand before and I am not being paid for this post either. Sharon is all about organic, healthy living so I knew this brand had to be primarily about using nature to enhance beauty. Neal's Yard Remedies is a brand from England that is direct sale marketed in the United States via consultants. Think of how Avon and Mary Kay work. The company strives to be a world leader in natural health beauty by sharing their expertise and encouraging a holistic way of health, beauty, and overall well-being. The brand is cruelty-free, it is not a vegan company but some of their products are vegan. They also believe in Fair Trade in sourcing ingredients for their products. I always like supporting company who utilize Fair Trade practices in sourcing. My buddy Sharon is a consultant who sent me a few samples of the brand's products to use. Unfortunately, I cannot give reviews on the products I used as there was not enough of each for me to properly test the results. Y'all know I like to test skin care for at least two weeks before reviewing. I will mention the products I've used and my initial thoughts about them. I was sent two sample foil packets of the Frankincense Facial Oil and the Rose Facial Oil . Both oils felt great being applied to my face and neck. They absorbed into the skin quickly and did not leave it feeling oily or slick. My face did not have an oily shine to it either. I loved the smell of both oils. The rose oil has the scent of real, natural roses. The smell of natural rose is soft not powdery like the synthetic rose scents that many of us are used to. The frankincense oil surprised me, as I thought the scent would be too potent for me. However, the scent was stronger than the rose, but it had a calming effect on me. The amount in the foil pack for the White Tea Toning Eye Gel was enough for a few days. It still wasn't long enough for me to see any results or notice a difference in performance compared to other eye treatments I've used in the past. It did feel cool as I smoothed and patted it around my eye area. I was actually excited to try this out. I hadn't been able to exfoliate my skin and it needed some gentle sloughing off. When I see the polish related to facial skin care I am expecting a fine grain exfoliant or smooth crystal like fine salt or sugar granules. I was disappointed when I opened the foil packet to see natural particles resembling seed or bark fragments. This disappointed me because when you are my age, your skin does not bounce back as quickly as it did in your 20s and early 30s. Exfoliating scrubs like this can cause little tears in the skin that do more damage than good in the long run. So, I didn't even use it. I did notice it had the same beautiful rose scent that the facial oil had. I know I am not a baby. However, the skin on my body has become ultra-sensitive this year. So, I was eager to try this because baby products do work better me... at age 40. I smoothed the sample of the Organic Baby Balm over my hands and it felt nice. I can compare the feel of this to Burt's Bees Baby Bee Multipurpose Ointment. The big difference between Burt's Bees Baby Bee Multipurpose Ointment and Neal's Yard Remedies Organic Baby Balm are the ingredients. Burt's Bees slapped the label of 100% Natural on its product but the ingredient list has some questionable ingredients that don't entirely read as natural. The ingredient fragrance is always a gray area, even if the label tried to explain that it is natural fragrance. The Organic Baby Balm has four ingredients: Sunflower Seed Oil , Coconut Oil , Shea Butter , and Beeswax . 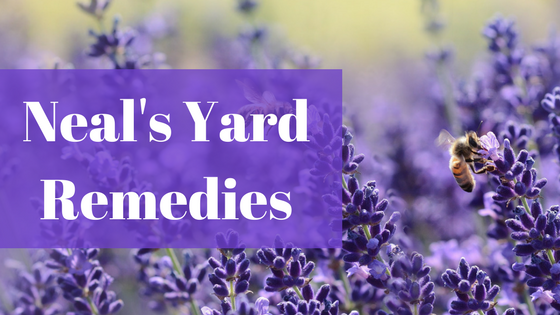 Neal's Yard Remedies is not a discount or traditional drugstore brand. The prices are not in the lower range. Expect to pay on average mid- to higher end prices somewhere in the $20 to $60 with some prices exceeding $100. If you want to find a skincare company that is cruelty-free and using primarily all natural and organic ingredients, then give Neal's Yard Remedies a try. I think my natural skincare lovelies, may fall in love with this brand. Also, if you know of someone who sells it, go to their next party/event to see for yourself if this brand is right for you.